Former governor of the State of Mexico (2005-2011), Enrique Peña Nieto, 44, is currently the front-runner in the 2012 presidential race according to numerous polls. He formally joined the race on September 19, 2011 and officially became the Institutional Revolutionary Party’s (PRI) candidate on November 27, 2011. Peña Nieto won the PRI’s nomination based on his record as governor of Mexico’s most populous state, and his ability to portray himself as the “new face” of the PRI, the long-ruling party that held the presidency for 71 years until 2000. After its defeat in 2000, the PRI experienced a number of leadership changes, soul-searching, and internal reforms that initially divided the party between an old-guard and a newer generation of leaders. Peña Nieto successfully overcame the internal divisions and united the party around his candidacy giving him an automatic electoral advantage as the head of Mexico’s largest and most powerful party. His opponents portray him as a “puppet” of the old PRI that seeks to recover its political power; and, conversely, as a charming media personality with an actress wife, but otherwise without much gravitas. Nevertheless, he continues to do well in the polls and with a united and focused PRI behind him he becomes the clear frontrunner in the July 1st election. Officially, Peña Nieto is running on the Compromiso por México platform, made up of a coalition between the PRI and the PVEM. -View this Reuters article on Peña Nieto’s campaign from April 2012. -See Dr. Duncan Wood’s profile of Peña Nieto for the Center for Strategic and International Studies from October 2011. -Read an Atlantic Monthly profile on Peña Nieto from its October 2011 issue. -Read his announcement of his intention to run for PRI’s nomination on September 19, 2011. -View his biography and networks on Excélsior’s website. -View an analysis of his prospects by Dr. Duncan Wood on the “Mexico 2012: Tracking Democracy in a Time of Uncertainty” blog. 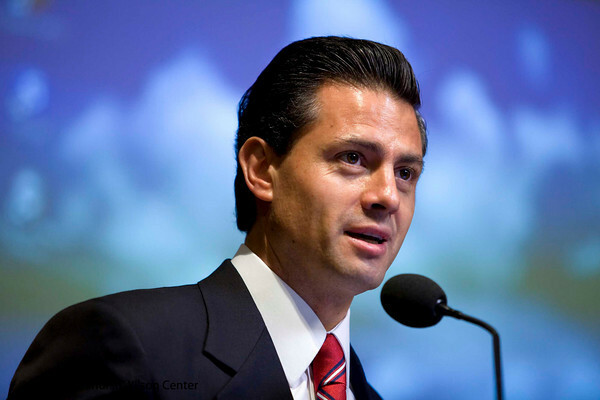 -Read or watch Peña Nieto’s remarks from an August 2010 talk at the Mexico Institute.